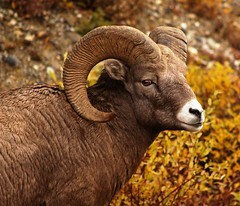 An Alberta Visit: Be Prepared to Meet at least one Sheep! Alberta is one of the most beautiful places on earth. I should know. I live here. Yes, I travel to other parts of the world, and I do so frequently; I would go nuts if I didn’t. But I love traveling in Alberta, too. Alberta is home to the Canadian Rocky Mountains. Two of the most visited ski towns are located here, too: Jasper and Banff. Travelers along the mountain highways will often be treated to the sight of flocks Rocky Mountain sheep (yes, they look like goats – but they are sheep).